The first hack to help you get from here to there this winter is de-icing your locks with hand sanitizer. 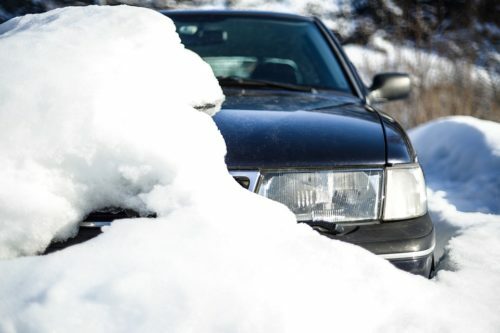 Your car can freeze over when sitting in your driveway or parking lot. If you are trying to unlock your vehicle and the locks are stuck, use an alcohol-based hand sanitizer to melt away the ice and open your vehicle with ease. The second tip to help you conquer the winter roads is packing kitty litter into your trunk. Kitty litter can be used for getting your car out of the snow when it is stuck. Kitty litter creates traction so your wheels can move, helping you stay on the go. Old socks don’t have to be thrown away. Instead of getting rid of your old socks, think about using them to prevent your windshield wipers from freezing to your windshield. Placing old socks on your wipers when your vehicle is parked can keep your wipers from freezing. The final hack to help you with winter driving is covering your side mirrors with plastic bags. Doing so will prevent frost buildup, snow collection, and ice. This way, you can save yourself the step of cleaning off your side mirrors after your car has been parked for an extended period of time. With these tips, you’re ready to hit the road this winter. To find a car perfect for your needs, shop at Certified Headquarters. We have a remarkable lot filled with vehicles you will be sure to love. Visit our dealership at 873 Middle Country Road in St. James, or give us a call at 631-366-3700 to learn more information about what we have to offer today!